Samurai Champloo is one of my favourite anime. It has great action and the hip hop soundtrack is fantastic. I'm glad to say that the art book is pretty good too. It's a well-bind hardcover book that's about 13-inch (monitor measurements). After reading the foreword, I realised that it was the creator of Cowboy Bebop, Shinichiro Watanabe, who directed this anime. No wonder it's good. This art book is split into two halves. The first contains colour art and the latter line art. Both feature drawings for the background and characters. Some of the colour art look very similar to the anime. The character art is, well, just great. I've great difficulty telling if they were actually screen shots from the anime. But most certainly they are not. There are background paintings of the places the three main characters went and others not used. I like particular the splash pages and some of the covers down for their DVDs. There are plenty of character and background designs for the line art section. One bad thing here. The line art for the three main characters were just rehash from the coloured section without the colour. I was expecting to see more sketches for the main characters, especially Mugen. There are no captions except for descriptions for the Fuu, Jin and Mugen. Fans of Samurai Champloo should find this a satisfying book. 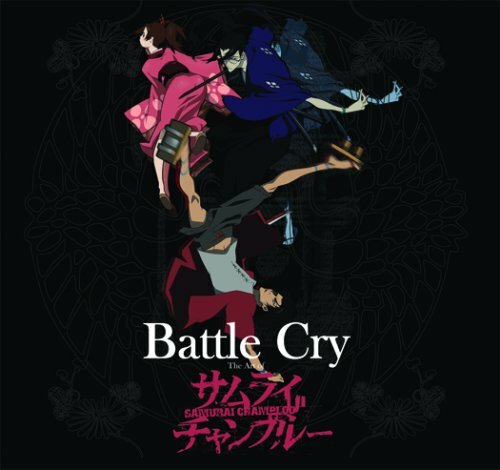 Battle Cry: The Art of Samurai Champloo is available at Amazon (US | UK).